Hey babes! 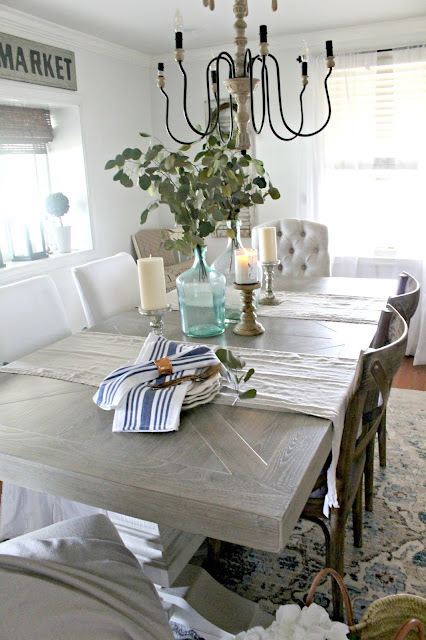 I'm SO excited to finally share our little dining room refresh with you guys. It's been a long time comin' because I know I've been talking about wanting to do it for months. But with the multiple projects we have going on currently it just got put on the back burner, especially since we have so many other things going on here at the Scardina Casa and with the weather warming up we've been doing a few things outside. I've been wanting to paint our dining room for a long time. I've always loved the color it was previously, Wood Smoke, By Behr. but it was just time for a change. I get bored when things are the same for a really long time and for me apparently, 5 years is a really long time. Like, a really really realllllllly long time. So here we go!! 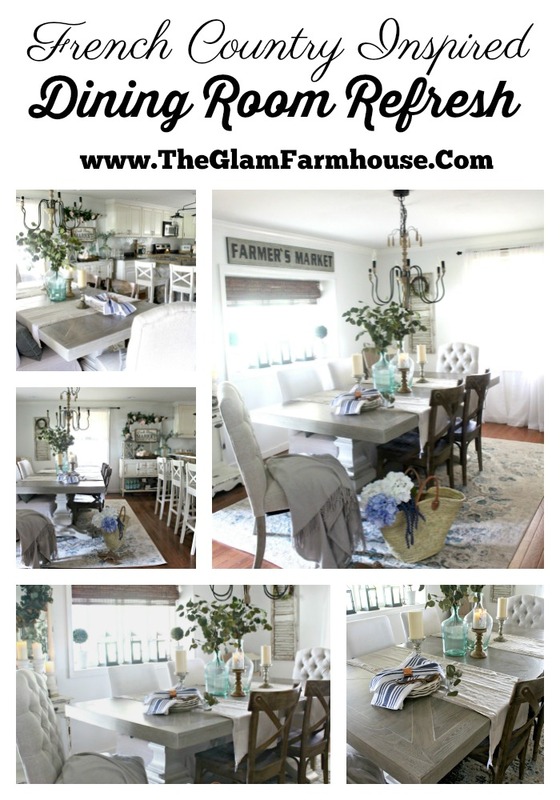 I'm so excited to give ya'll the details of our dining room refresh! Our dining room is at the front of our house, which is also where we have a big huge tree blocking the sun from coming in for a large part of the day. This means the dining room often looks dark and looked even darker with the dark wood tones, and darker walls. I knew I had to do somethings to make it light, bright and airy again. 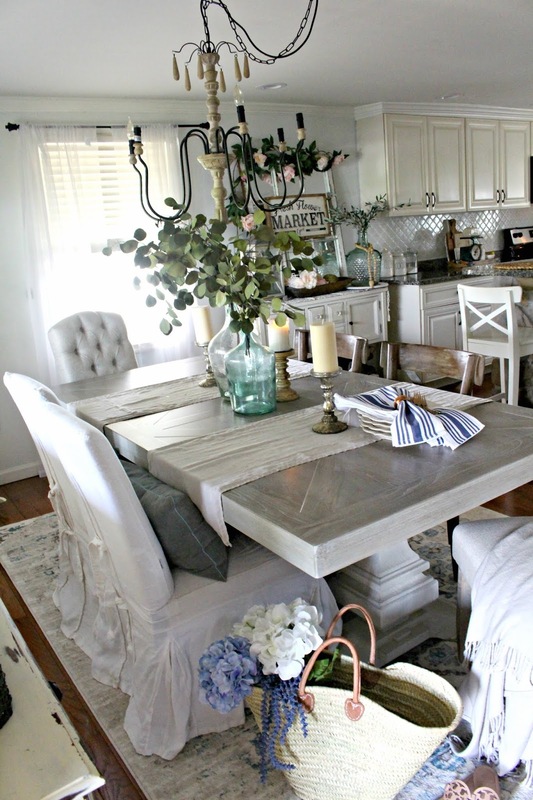 It started with choosing a white paint color. Which can be easier said than done my friends. Easier said than done. 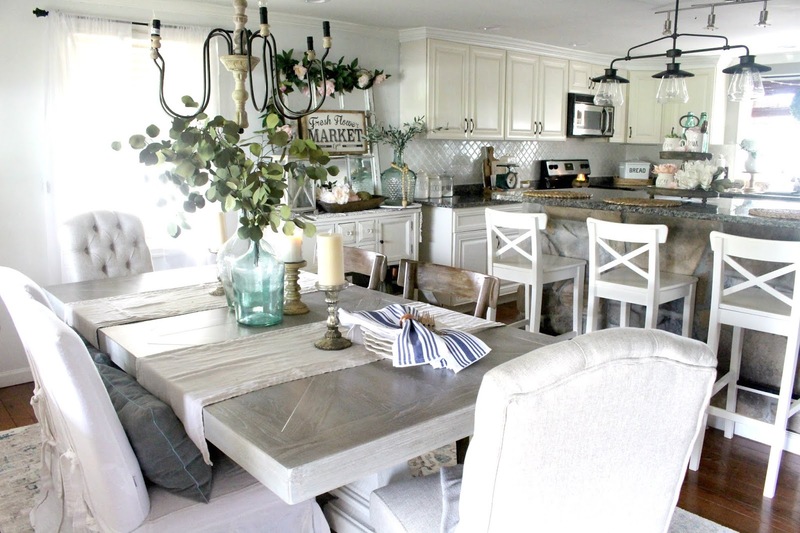 I have a few different white shades in our home but this one has a gray base which I really loved. It's actually a gray color but looks more white to me, just with a sight gray tint. I hate STARK white rooms so this was the perfect color for me. I always tend to shift towards grays anyway. 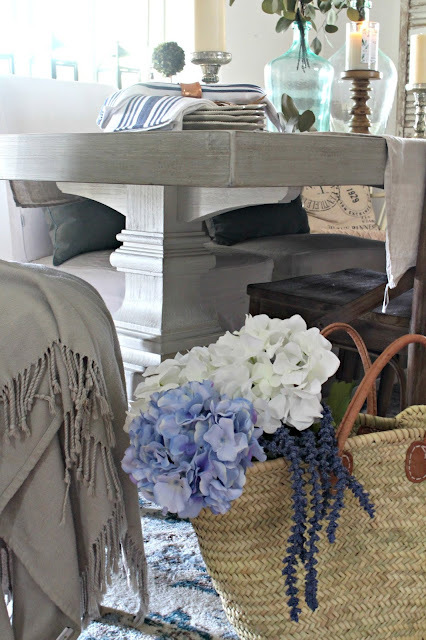 I also knew I had to add a few things to brighten up the space, I realized that the dark table, although I did love it, didn't help with new "look" I was going for. 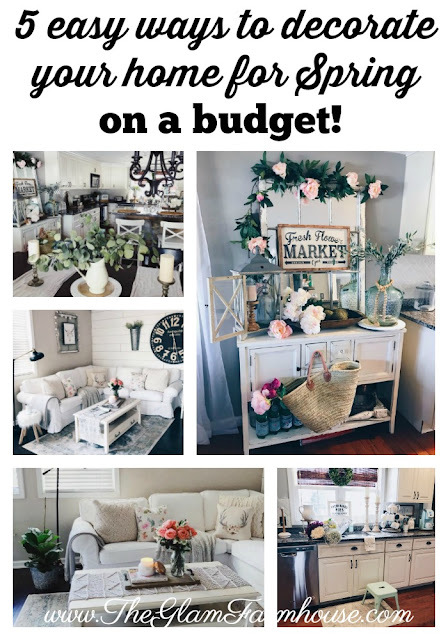 When I was coming up with budget friendly ways to update this space, I knew I would, for the most part, keep the decor the same and would instead opt for a few BIG updates. Like the table, new chairs, and a new chandelier. I have always loved mixing furniture together to create a space that feels unique to me, so I kept with that trend and opted for 2 new sets of chairs, one set World Market had light wood tones to help ground things a bit, and the other set for a bit of glam cottage type of vibes. 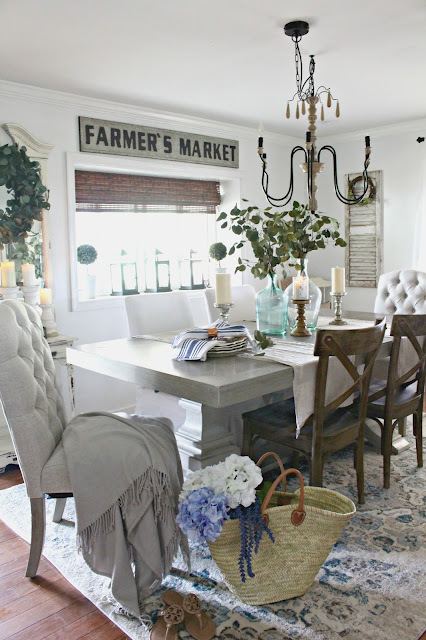 I loved tufted anything lately and these chairs are super gorgeous! I knew I wanted more of a french country style chandelier and this one was exactly what I was looking for for my space! 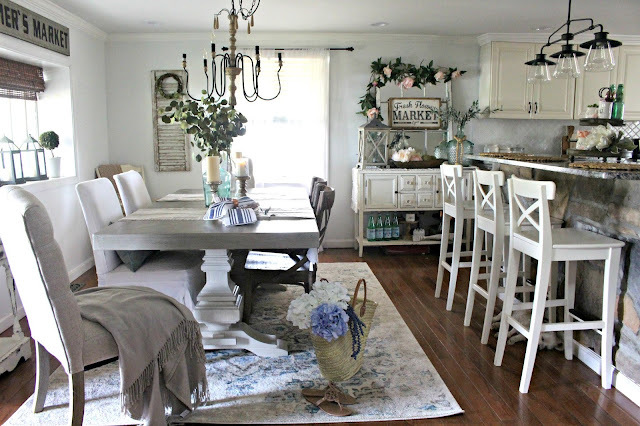 I also ditched the last jute rug I had in our house and opted for one with lighter tones and colors to tie in the accents in the space. This one is under $120 and a STEAL! The colors are gorgeous and it's exactly what I was looking for. I'm really happy with how it turned out, the new spaces feels fresh, light and airy. Especially compared to the way it was before. You can shop everything from this post below, but feel free to shoot me a message if I missed something! What do you guys think about the changes? Are you working on any room make-overs of your own? I'd love to hear about them! Shoot me a message, leave a comment below or come hang out over on Instagram! Looks so good! Not that I’m surprised!!! 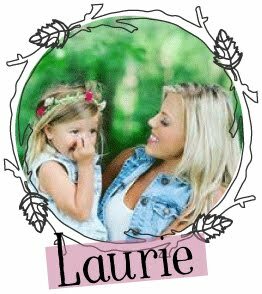 Thanks Laur! You are always the sweetest!